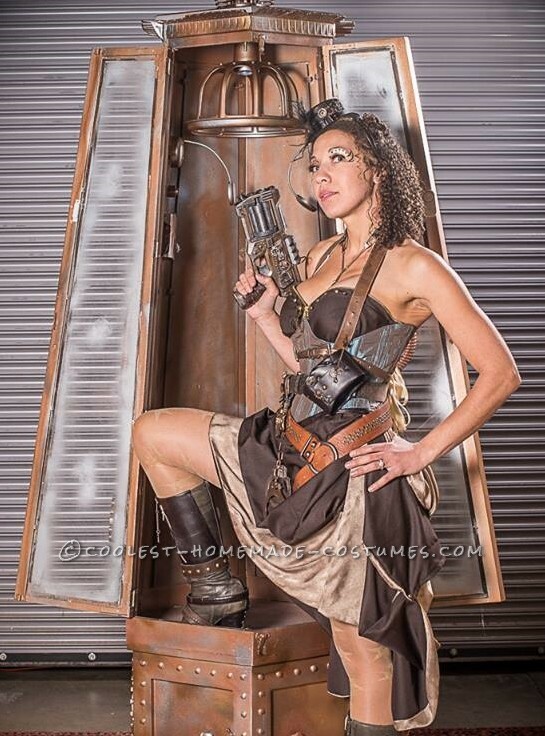 I discovered steampunk in the Summer of 2013. 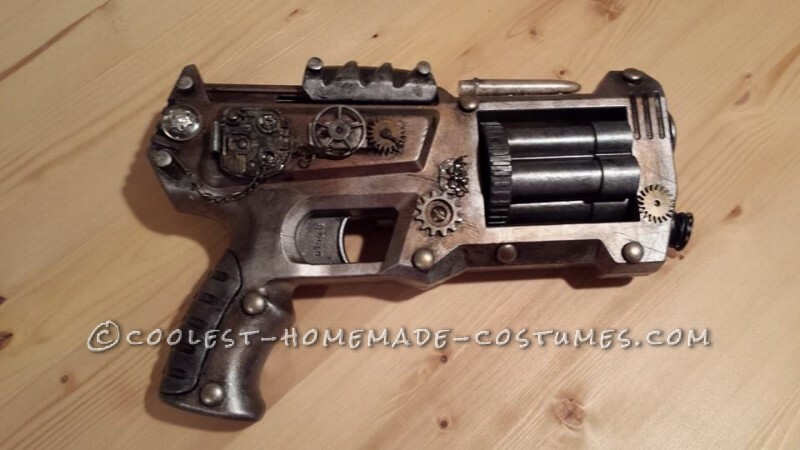 I was instantly sucked in and decided to completely change my plans for Halloween just so I could carry an awesome steampunk gun. 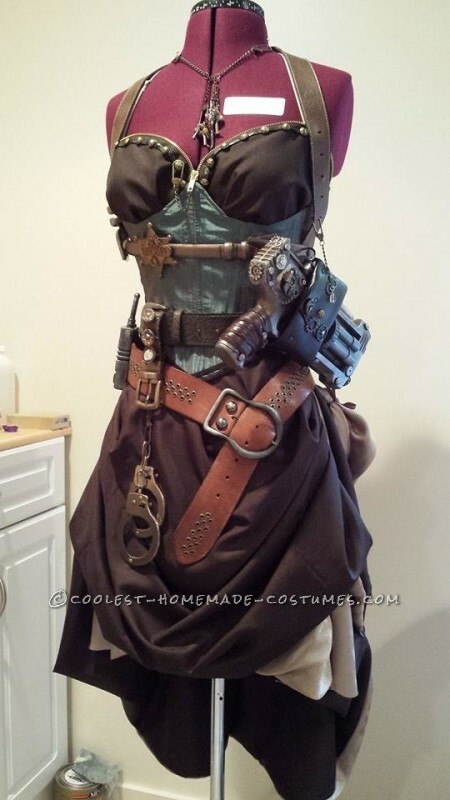 I settled on a steampunk sheriff costume. I purchased about $200 worth of rich fabrics and went all out stitching this creation together. 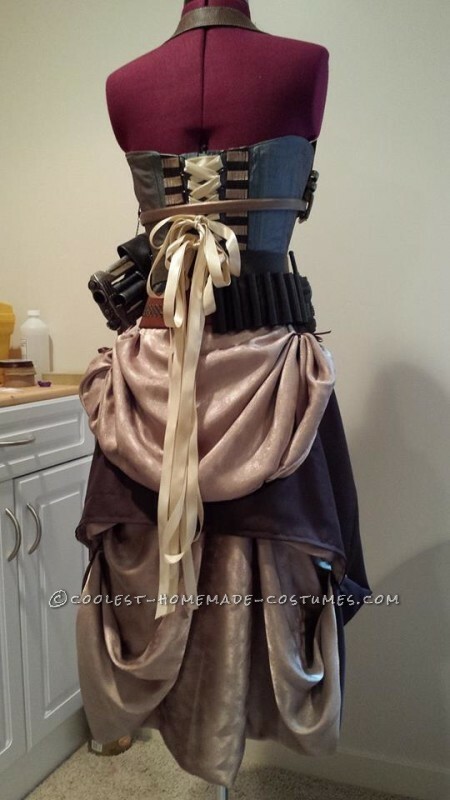 I handmade the corset and skirts and set each eyelet and gear myself. I carefully and thoughtfully added zippers, chains, brads and buttons to each element of this ensemble. 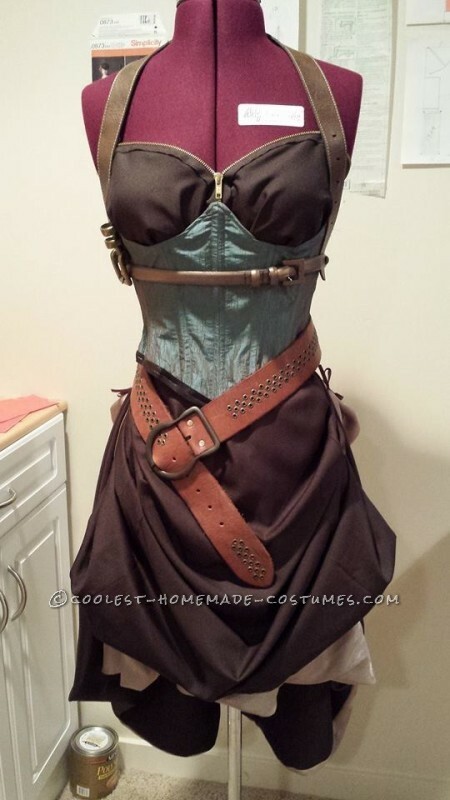 I used a zipper on the neckline of the corset and a belt for the halter strap. 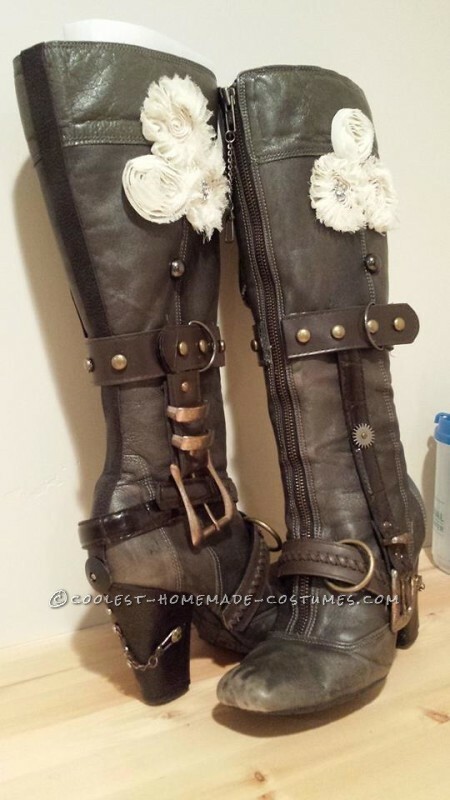 I found belts and boots at a thrift store and some feminine decorative elements to soften the look. I attached a small felt hat to a headband and decorated it with feathers, gears and a beaded butterfly. I mixed several charms together and created a necklace with leather strapping and decorative clasps. I purchased toy metal handcuffs and painted them to add a dingy, used look. A plastic toy sheriff’s badge was also painted and embellished with gears then attached to the bodice. There is even a toy radio that was also attached to the ammunition belt. My favorite piece is the plastic gun I found at a chain store. I took the gun apart and hand painted each piece, distressed it and then put it back together. I added several embellishments including a bobbin, a seam ripper cover as well as buttons and gears. I then rubbed the gun with sandpaper and scratched the surface before wrapping the handle with leather to add a well-worn grip to the piece (not included in the close up photo). The final look was completed with hair and makeup, done up just enough to pull it all together. This was the most expensive, most elaborate, most detailed costume I have ever undertaken and I love it. I wish I could wear it out in my everyday life without drawing stares and whispers from everyone else, but I will have to settle for tea parties with my daughter J. Thank you for allowing me the opportunity to share my creation with you!